We want to make your Holiday Shopping as simple as we possibly can! We have put together a few gift guides featuring amazing products with even better deals to help you enjoy the holidays stress-free this year :). Got some stockings to fill this year? Check out our Stocking Suffer Ideas! Got a Secret Santa coming up?! Here are some really amazing Gifts under $25 to help you find that perfect gift for the perfect price! Got someone in your life that’s doing a Ketogenic Diet this Christmas season? WELL, look no further! 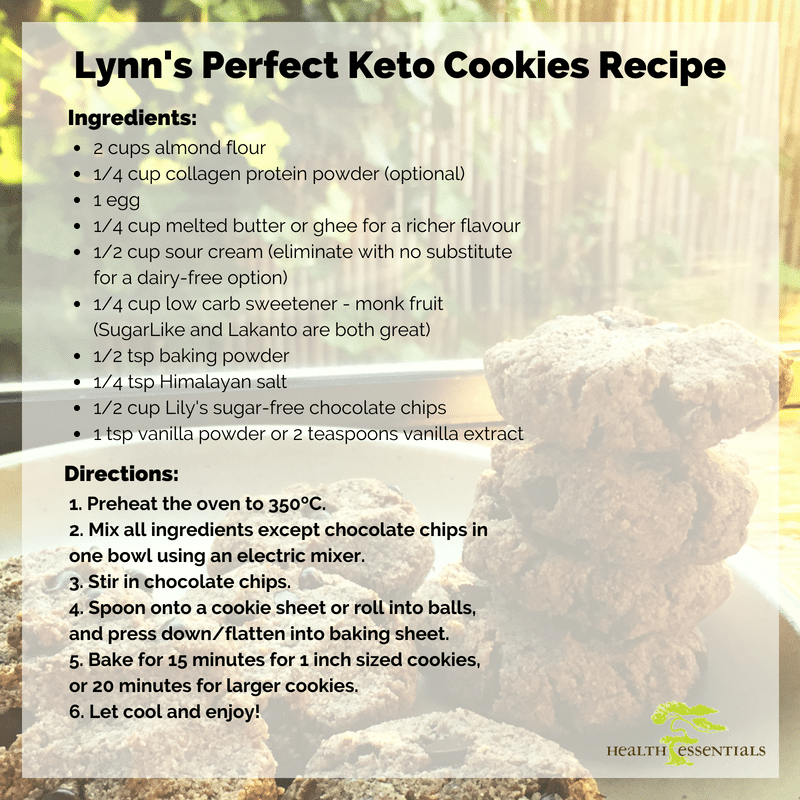 These keto cookies are a piece of cake to make. I take the easy route and mix all ingredients together (minus the chocolate chips) and blend. Once everything is mixed stir in your choclate chips, spoon into balls and bake. Include the collagen if you’re looking for a higher protein option and elimitimate the sour cream if you prefer a dairy-free cookie. The sour cream makes these super soft. If you’re going for the dairy, the cookies don’t brown and may not seem ready but they are! 1. Preheat the oven to 350ºC. 2. Mix all ingredients except chocolate chips in one bowl using an electric mixer. 4. Spoon onto a cookie sheet and roll into balls, gently press down into the baking sheet to flatten. 5. Bake for 15 minutes to 20 minutes depending on cookie size. Plans to have a little fun this Canada Day long weekend? Or, ANY weekend this summer? 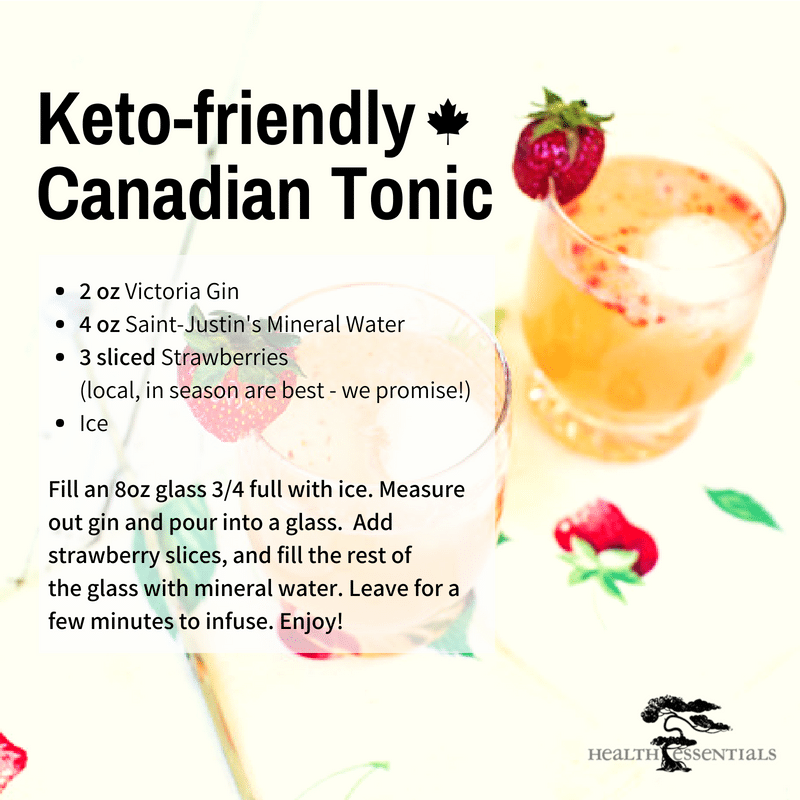 Check out this all Canadian sourced, and ketogenic diet friendly drink idea! What’s New at Health Essentials This Spring: More Great Keto-Friendly Food Options! Are you following a ketogenic diet? Are you trying to keep your diet low-carb? Do you simply appreciate great sugar-free and no-sugar-added food options?! Well, then you’ll LOVE these new foods we’ve got in this last month or so! 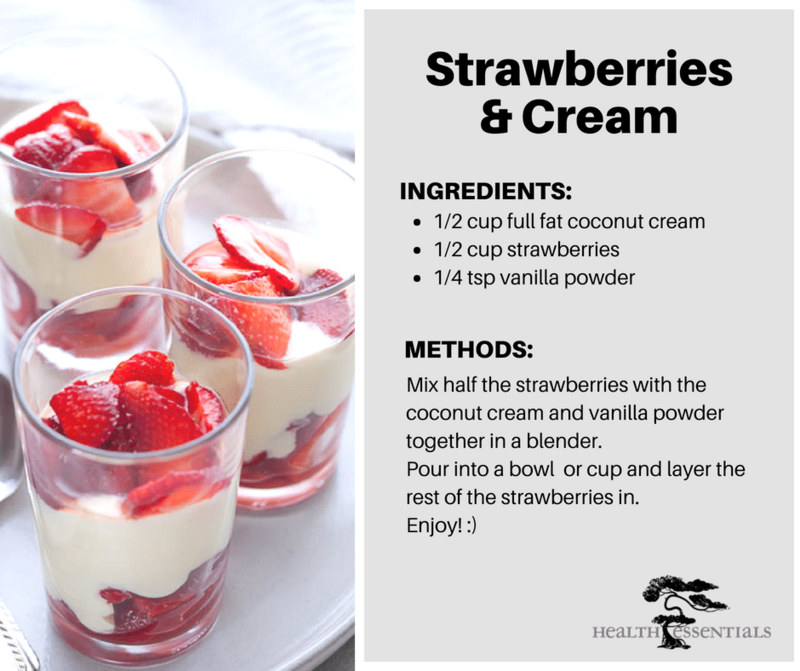 This awesome Superfood Creamer is simply amazing as an on the go addition to coffee, tea, smoothies or yogurt! It’s packed with nutritional ingredients including flavourful coconut milk powder, saturated-fat rich coconut oil, and Aquamin, derived from a red marine algae for added calcium and 72 other bio-available minerals! This blend was formulated by world-renowned big-wave surfer, Laird Hamilton. He is a fitness guru who has spent years perfecting ways to pack tons of nutrients into his busy, fitness filled days for sustained and focused energy! Each packet contains only 3g of total carbohydrates! These ridiculously delicious little bars are the perfect snack for long, busy days on the go, or as a treat after a long work day! PLUS, with less than 5g of net carbs per bar, no need to worry about falling out of ketosis. Believe us, you’ll be surprised at how much they taste like a treat. Available in Coconut Chocolate Chip, Mint Chocolate Chip, Peanut Butter Chocolate, and Almond Chocolate. Barbecue season anyone? These next items are must haves for keto-friendly barbecues. Wait, you mean I can have BBQ sauce on a keto diet? YES! This one. With less than 1g of carbs, and 0g of sugar, this tasty gluten free barbecue sauce will have your burgers, steaks or chicken breasts tasting mouth-wateringly delicious!! And of course, what good BBQ is complete without mustard?! We don’t think there’s any! This extremely clean and organic mustard has 0g of carbohydrates per serving, and it’s SO delicious. Plus, it’s made with all local ingredients from the Northwest, so you can feel great about supporting this awesome company, while also enjoying some of the best mustard we have ever tried! Join us for a HUGE day of celebration on Sunday, July 1st! so be sure to stock up for your long weekend festivities while we’re open! Sauté onions in butter. Once translucent, add chopped squash and season with salt and optional cinnamon. After a few minutes add your coconut milk, bring to a boil and then simmer until squash is soft. 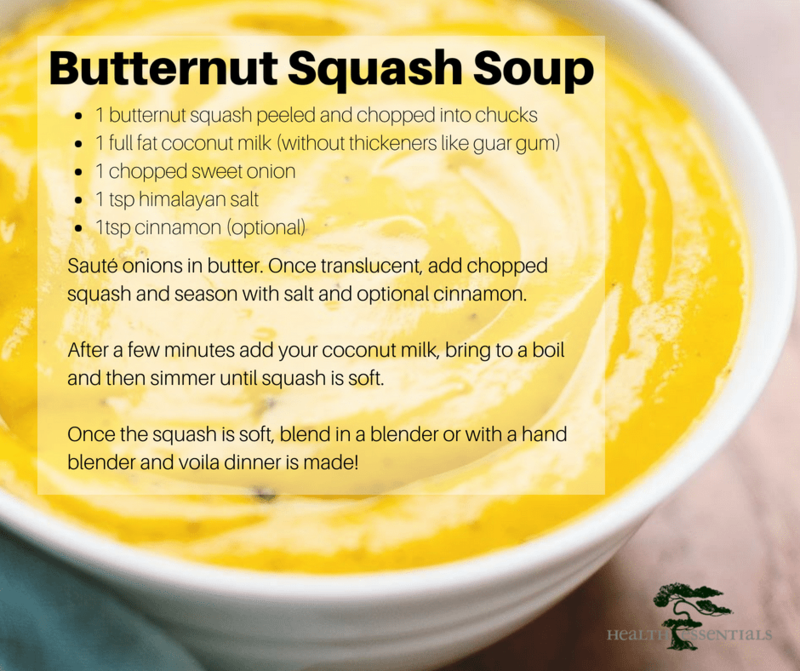 Once the squash is soft, blend in a blender or with a hand blender and voila dinner is made!